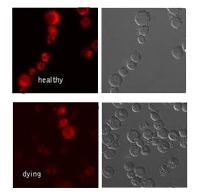 Jurkat cells were cultured in the absence (healthy) or presence (dying) of the apoptosis inducing agent staurosporine. Cells were stained with the Mitochondrial Membrane Potential MitoPT™ TMRE Kit (ICT946). Apoptosis, or programmed cell death, is an essential process that ensures an organism’s health by eliminating damaged or aberrant cells. The process is induced by a variety of stimuli and mediated either through cell surface death receptors (extrinsic pathway) or the mitochondria (intrinsic pathway) (Galluzzi et al. 2008). Our webinar entitled “A question of Life or Death” provides an overview of the different modes of apoptosis and what antibody applications and assays to use to differentiate between healthy and apoptotic cells. Special focus will be placed on explaining the different stages of apoptosis and what experimental read-outs to use to determine if a cell has passed “the point of no return”. Judith graduated from the University of Dundee (Scotland) with a B.Sc. in Molecular Biology and a Ph.D. Her thesis research, in the group of Prof. Jeffrey Williams, focused on elucidating STAT signaling pathways in the social amoeba Dictyostelium discoideum. For her postdoctoral research, Judith moved to Dr. Ketan J. Patel’s group at the MRC Laboratory of Molecular Biology in Cambridge, where she was investigating the role of the Fanconi Anemia DNA Repair Pathway. Since leaving academic research Judith has held product management positions in both Germany and the United Kingdom during which she was involved in the development and global launch of novel antibody portfolios. Galluzzi et al. (2008). Viral control of mitochondrial apoptosis. PLoS Pathogens 4, e1000018.